Bull and cow symbolism is widely used in many ancient cultures. The cow, bull and horn symbolism is related to the Sun and consciousness symbolism of resurrection and rebirth. This symbolism is also the source for the first letter in many languages, the letter A (alpha/aleph/alef, al/el/God), and also what was once considered the last letter, T (tav/tau). Aleph/Alef and Tav/Tau, first and last, beginning and end, is like the reference to Alpha and Omega as the beginning and end. These are the letters A and T, which relate to Bull/Tauro symbolism, as does the Ancient Egyptian word ka. 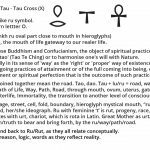 The ankh is symbolism of the Tau Cross (bull/Taurus) and Ru mouth/gate/womb symbolism for higher, realer, truer life through bearing our own cross and crossing over or passing over to a new world we take upon ourselves to create. Aspiring to the oval, mouth, gateway and womb of higher consciousness symbolized by the air element. 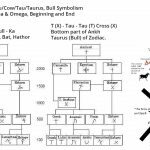 Tau developed into Tau(rus), Taurus the Bull/Ox of the Zodiac (Apis, Aleph, Alpha, A). The top of the Ankh is an oval, Rw/Ru. Tau+Ru = Taurus. 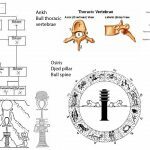 Wheel of the Zodiac, is Wheel of Time/Dharma, Rota, “chariot” (of the gods), “solar bark”. 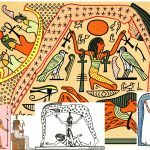 Ru (mouth, womb), the oval from the Ankh, is where the “Good” Spirit is, in the air, sky, sun. Ru is rue, road, path, way to “heaven” above. 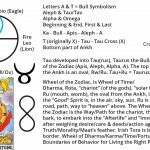 The Wheel of the Zodiac is the Way/Path for the chariot, the solar bark, to embark into the “Afterlife” and “Immortality”, after weighing desire/care & deeds/action against Truth/Morality/Maat’s feather. Irish Tora is boundary, border. Wheel of Dharma/Karma/Time/Fortune/Fate/Destiny. Boundaries of Behavior for Living the Right Path/Way. Cause/Effect. “3. The Lakota Symbol for Sun-Earth Connection The inverted triangle on top symbolizes the stars and/or the Sun. The triangle on the bottom symbolizes earth sites. The Lakota strongly believe that there is a powerful connection between the Sun and the Earth. Much of their culture has been directly influenced and shaped by centuries of solar observation. 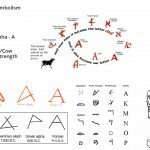 Bull, Cow, Ox, Apis – A, Alef, Aleph, Alpha – Power, Strength, Energy, Force, Leader, Authority, First, “God”. “God”/El/Al/A, Sun and consciousness are the creative source of life/”life” and symbolically correspond to each other. 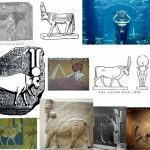 The Sun, “God” and Bull/Cow symbolism are intimately linked in many ways. An ox is a castrated bull, with no more life force of fertility. 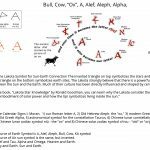 The symbolism of life force, power, etc., is for the Sun as well, corresponded through the bull-cow. raise to a higher consciousness. The cow-bull symbolism often has the Sun disk between the horns. The power, strength, energy and “god” as the Sun is symbolized through this animal. 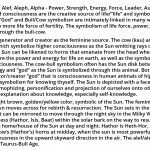 Both the sun and bull symbolize the generator/creator “god” that is consciousness in human animals of higher order consciousness. It’s all symbolism for knowing thyself. The Sun is depicted with a face in many esoteric symbolism. Anthropomophizing, personification and projection of ourselves onto other symbols of reference is a tool for explanation about knowledge, especially self-knowledge. Some cows are of a light brown, golden/yellow color, symbolic of the Sun. The feminine aspect of the air/sky is where the sun moves across for rebirth & resurrection. 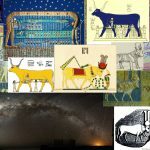 The Sun sets in the west, and instead of traversing the earth, it can be mirrored to move through the night sky in the Milky Way path (Nut), or through the cow goddess (Hathor, Isis, Baat) within the solar bark on the way to resurrection. The feminine sky-air is the home/house of the Sun at day and night. Hathor is Heth-Hor, “House of Horus”. The Sun rests in the cow’s (Hathor’s) horns at midday, when the sun is most powerful and symbolizing higher life and consciousness in the upward skyward direction in the air. 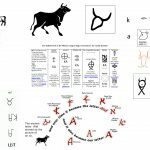 The alef/aleph/alpha-bet, was developed during the Taurus-Bull Age. Book of the Dead (”Book of Coming Forth by Day”, “Book of emerging forth into the Light”) Book of the Dead has many gates in the story. Rebirth into the Day with the Light of Truth. a.k.a Pyramid Texts, Coffin Texts. Pyramids of wisdom, coffin of resurrection. Both have to do with the underworld, netherworld, and passing/crossing over. Gate, mouth, Ru/Rw. 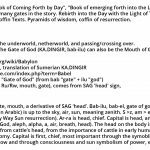 The Gate of God (KA.DINGIR, bab-ilu) can also be the Mouth of God. 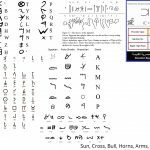 The Sumerian KA is gate, mouth, a derivative of SAG ‘head’. Bab-ilu, bab-el, gate of god. The direction of the head (‘samt ar-ra’ in Arabic) is up to the sky, air, sun, meaning zenith. S >z, am > eni, t > th. Samt is way/path (Cow & Milky Way Sun resurrection). Ar-ra is head, chief. Capital is head, and means chief, most important, first (God, aleph, alpha, a, air, breath, head). The head on the body is most important for life. Capital comes from cattle’s head, from the importance of cattle in early human dominator predator culture economy. 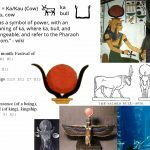 Capital is first, chief, most important through the symoblized connection of the head, horns, bull-cow and through consciousness and sun symbolism of power, energy, authority, etc. Ka/Kau – Bull/Cow. Power, strength, fertility. Power of action in the world to create from consciousness, self, soul, spirit, essence, etc. of who we are. Aspiring & rising up to higher consciousness. Real spirituality is morality. Your spirit, soul, self & character is defined by what you do with what you know about reality and self/consciousness, your behavior relecting who you are. Upright Arms, right-angle, Power/energy to Act with arms and hands. Our Moral ”Spirit”-Essence-Nature determines our Quality of life. Character, Behavior, Actions, Deeds. Ka-racter, Ka-risma. Who we are, by our actions and deeds, determines our quality of life. 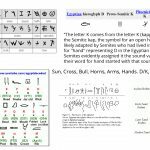 Yod – hand/arm side, Vav – hand/arm upright. Tau developed into Tau-rus (or vice versa). It might also come from Taweret (also spelled Taurt, Tuat, Taouris). Tau, Tau-Ru, Taurus from Taouris. Taurus the Bull/Ox of the Zodiac (Apis, Aleph, Alpha, A, Al, El, God, Sun, Cross, Ankh). 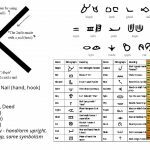 The top of the Ankh is an oval, Rw/Ru. i.e. Evolve Consciousness, here, on the ground, into Truth. Hebrew ruach (Ru+akh) = breath, air, life, sky, spirit, mind French rue = road, path, way. Good and Evil Knowledge (Morality). Ru, mystical mouth (ankh ru oval part close to mouth in hieroglyphs). Breathe of life of Ankh, the mouth of life gateway to our realer life. In Chinese tau and lu joined together mean the road. Tao, dao. Tau + lu/ru = road, way, path. 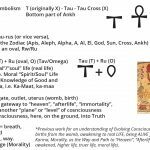 Tau + Ru = Ankh = Breath of Life, Way, Path, Road, through mouth, ovum, uterus, gate, and gateway to Heaven, Afterlife, Immortality, the transition to another level of consciousness. Ru is door, circle, passage, street, cell, fold, boundary, hieroglyph mystical mouth, “rue des femmes”, womens road, her/she ideograph. Ru with feminine ‘t’ is rut, progeny, race, route, road, rota. Rut permutes with urt, chariot, which is rota in Latin. Great Mother as urt/rut, the chariot as for child/sun/truth to bear and bring forth, by the ru/way/path/road. 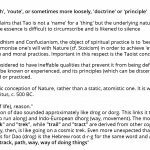 Tao relates to Logos, and back to Ru/Rut, as they all relate conceptually. Logos, the ground for reason, logic, words as they reflect reality. From Hinduism, where behaviors are in accord with rta. Buddhism, “cosmic law and order”. Jainism, doctrine of “purification and moral transformation of human beings”. Sikhs, dharm, the “path of righteousness”. Sanskrit verb root r- “to go, move, rise, tend upwards”. 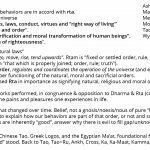 Rtam is “fixed or settled order, rule, divine law or truth”. Vedic Rta (Sanskrit rtam “that which is properly joined; order, rule; truth”). A principle of natural order, regulates and coordinates the operation of the universe (and everything within it), responsible for the proper functioning of the natural, moral and sacrificial orders. Dharma & Karma eclipsed Rta in importance as signifying natural, religious and moral order in later Hinduism. Karma (action, deed), works performed, in congruence & opposition to Dharma & Rta (cosmic order, law). Causal relationship to the pains and pleasures one experiences in life. Source concept is rta, that changed over time. Belief, not a gnosis/noesis/nous of pure “knowledge”. Karma concept is used to explain how our behaviors are part of that order, or not and suffer. A need to believe things are inherently “good”, answer why there is evil to fill gap/unknown. Karma equivalents are Chinese Tao, Greek Logos, and the Egyptian Ma’at, foundational feminine mound upon which “creator god” stood. 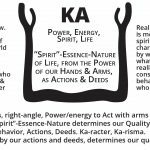 Back to Tao, Tao+Ru, Ankh, Cross, Ka, Ka-Maat, Kamma, Karma, Dharma.